1. Find a Bible that will encourage and motivate me to read and learn more about God and myself. 3. Find a long-term career that I enjoy and that makes me a better person. 4. Pay off my credit cards. 5. Continue to find budget-cutting ideas. 6. Stick to my budget and hopefully come in under budget in as many areas as I can as often as possible. 11. Pay off my new car. 12. Trust that God will reveal His plans for me in terms of a job, an apartment, and a car. 13. Fully and completely trust in God and His plans for me whether I understand them or not. Car update: Here she is! I'm sure you've all seen much, much worse--I know I have. But, to me, this was as scary as it gets. I know that it could have ended a lot worse than it actually did and the only thing I can do is thank God that it didn't. As you can see, all the damage was done to the front drivers side. That's another thing I immediately thanked God for--keeping Cat (as much as possible) out of harms way and allowing my side to get the brunt of it. In fact, I think the first thing I said to Cat was "Oh my gosh, I'm so sorry! I'm so glad my car turned so it was on my side and not yours!" to which she responded by giving me a huge hug and saying how thankful she was that we were both safe and uninjured. It's crazy to think that such a small amount of damage (I know, I know, that's a lot of damage--but in the grand scheme of things and in comparison to the size of my car, it's really not a large amount of damage) can cost $3-4,000 to fix! Ahh! Don't get me wrong, I'm grateful that nothing more than a stiff back and neck happened but it's just such bad timing! "Let not your heart be troubled. Ye believe in God, believe also in me. " You know that feeling where some days are just really worse than others? I'm kind of at a loss for words right now (literally--I just sat staring at the computer screen for 3 minutes) and I think it's because I'm not sure what else to say besides I miss you. And I don't exactly know how to fully express how much I miss you. I miss you every day. It's not a new feeling to me. I've lived with this hole in my heart for the past 4 years. I'm, dare I say, used to this feeling. But sometimes (like today), I just see a picture of you and it becomes hard to breathe. I see your beautiful blue eyes and would do anything to look into them in person. I see your huge grin and I wish I could say the stupidest thing to make you smile. If God gave me the chance to see you again, I can guarantee you I would not waste a second. The thing is, I know that won't happen until my time is up here on Earth. And I've come to terms with that. I've dealt with it. And I understand it. But that doesn't mean that on days like today, I can't wish you were here sitting next to me watching Con Air something much cooler than Con Air. On days like today, I feel like I can't go another day, much less the next 40,50,60 years without seeing you, touching you, hearing your voice. I wonder how I'm going to manage. How I'm going to fall asleep tonight knowing that instead of sitting right next to me, you're looking down on me. But somehow I do. And I wake up the next day still missing you. But somehow it's not quite as bad as it was the night before. The one thing that keeps me going is that I know you're happy. I know you're having the time of your life. I just wish I was with you and could see you happy. I wish I was having the time of my life right next to you having the time of your life. That's all. I just really missed you and I thought you should know. I miss you like crazy. I love you every single day. You're my favorite person in the world--that will never change. And I can't wait to see you! yeah, that car is gone. When was I in the ditch? 3 1/2 weeks ago?? Apparantly my luck hasn't turned yet. God is really testing me. And as much as I want to say "bring it on G-O-D!" I'm afraid I can't. I know God only gives you things you can handle but I'm really at my breaking point. It's like He's saying "I know you had trouble believing in me and I know that you are fully giving yourself over to me...so let's just test you and make sure you stick around." Well guess what big guy? I'm not going anywhere! Is it rough? Sure is. Am I majorly stressing because not only will I be unemployed in a week but I'm now carless--and how in the heck am I going to get a job if I don't have a car to get to interviews? Absolutely. I might be at my breaking point but that doesn't mean I'm going to break. I'm going to take whatever God gives me as hard as it is to handle. For those that are confused, I'll give you the short story. Picked up Cat this morning. Got on 36. Crashed into a car that had already crashed into a van that had already crashed into a car. Got it? That would make me the, yes, fourth car in that accident. Right after my car crashed, the state patrol showed up and blocked off 36 so if you were watching the news and heard about the accident that shut down 36...yeah...I was in there. Cat's okay, thank God. We're both a little sore and our backs are really stiff but if that's the worst that happened to us, I think we're in pretty good shape. As much as I sit here and dwell on the fact that I no longer have a car, I am alive and that counts for something right? With that said, I have a message for you, big guy up above: "I'll take whatever you give me and I'll handle it as best as I can. If you decide that you're not done testing me yet, then I say it bring it on. But I would also like you to know that I'm not giving up on you--much like I don't want you to give up on me. So, you can keep pouring it on if you'd like, but if you've had enough, then I think I've had enough too. A little good luck Some of God's amazing grace would hit the spot right about now. Thanks." I'm kind of new to the whole 'prayer' thing. I mean, I've had the occasional conversation with God but it generally was along the lines of "hey, big guy...if you do this for me, then I'll like totally believe in you." Sometimes it was just a simple "help (insert name including my own) out." Or, if I really got myself out of my comfort zone, I'd say something like, "So...maybe you could like look after so and so. K see ya." So as you can see, I am an incredibly inexperienced prayer. I do the occasional dinner prayer, the holiday prayers, the prayers in church. But at dinner, someone else always says it or it's the normal dinner prayer that you learn when you're about 2. At church, you just read along. Yeah, there's silent prayer...but during that silent prayer, I'm usually, ya know, silent. I just have no idea how to go about prayer. And I will be completely honest with you--I feel really silly and awkward when I try. When I know that other people have things going on in their lives and I should pray or when someone specifically asks me to pray, I try. And I usually get something out. It's just not really what I'm thinking. I mean, how hard is it to just ask God exactly what you're thinking? Apparently for me it's pretty difficult. I could sit and have a conversation with someone (i.e. with Stefanie today about baby Bella and how God can create miracles and how we all hope and pray he's gonna pull one out.) I can convey to Stefanie exactly what I want to convey to God. But when I sit and try to tell God exactly what I told someone else, I feel weird. A little silly. A little judged (by who, God? Ridiculous. I know. As if God is going to tell me my prayer wasn't good enough.) And a lot self conscious. I'm just not sure how to get past that feeling of awkwardness when I'm trying to talk to God. Maybe it's because--in my head--prayer is completely different than conversation. And I need to realize it's not. Maybe even though I realize that prayer is simply a conversation with God, it's a one-sided conversation and I feel weird because no one is talking back to me in the way that a physical being would had they been sitting right next to me or talking to me on the phone. I know God knows what it's in my head and I know He knows whats in my heart. I also know that I don't have to tell Him for Him to know. He simply knows. But I hear all about the power of prayer and prayer warriors. And that's a club I want to join. I want to be able to tell someone I prayed for them without feeling 'geeky' or 'silly' or 'self-conscious'. Is this a completely strange thought process to everyone out there? Am I going to be embarrassed that I admitted to the world that I simply don't know how to pray? Or have other people struggled with this same thing? And if so, how did you get past all the weirdness you felt and just stripped down before God? Please keep praying! And thank you if you already have! customer: how many more days are you open? ...ma'am, if you wanted to know the DATE that we're closing, why didn't you just ask right away? me: Thank you for calling Linens N Things, Roseville. How may I direct your call? customer: you need to do something for me. customer: do you have ____ item? me: --chances are it's a no. customer: well if prices are going to go down tonight, i don't want to buy it yet. customer: are prices going down tonight? customer: i just spent a bunch of money here, can i have this cake pan as a gift? customer: no, but I can use it anywhere. me: ok but not here. me: we're in liquidation. due to a court order, companies that are in liquidation do not have to accept coupons. customer: so if you weren't in liquidation, you would accept it? me: yes, we would have. customer: so you can't put it on my discover card? customer: well. if you guys weren't going out of business, i wouldn't be coming back here to shop then anyways! Any and all prayers would be very much appreciated for this beautiful little baby girl! We all know God can work miracles so let's hope and pray that baby girl Schluter will be His next miracle! customer: what does this ring up as? customer: so there's no way to go off the clearance tag? customer: so do i get like 75% off displays? customer: even though it's a display? me: (am i stuttering??) yes. even though it's a display. customer: i don't really get that. me: ma'am, we are no longer owned by linens n things. the sign on the door may say 'linens n things' but we're owned by gordon brothers which is the liquidation company. The liquidation company does not allow us to take any additional discounts off of anything whether it's broken, a display, or has missing pieces. customer: ok but the clearance tag for the other one says 15.99 so can't you just take 50% off that? me: and we're back to that. no, we can't. ALL signs say discounts will be taken off the ORIGINAL price therefore off of 19.99 and your final price will be 9.99. I can call a manager up here to talk to you but he's going to tell you the exact same thing i've been telling you. customer: no...i just don't get it. customer: well yeah but i could say the same thing to you, it's only 2.50 so why can't you give it to me? me: because i'm already giving you 50% off. not to mention the fact that i'm not ALLOWED to do that nor is my manager. customer: could you call your manager up here? me: this woman would like 50% off the clearance price on this wine dispenser. i've already explained to her that all discounts are off of original prices and the clearance sticker no longer applies but she wanted to talk to you. customer: so i can't even get 75% off the display? customer: but the tag on this one says 15.99 so why can't i get 50% off that? curt (who, by the way, has become increasingly short with customers and is fun to watch): because all the signs say discounts are off the original price. you can see the original price is 19.99, a clearance price is not an original price. me: thank you for holding, how can i help you? customer: yes, you sell mattresses there? me: we are selling display mattresses, yes. customer: ok, how much is a queen size? me: we only have full size and they are $90 for the mattress, box spring, and frame. customer: oh so a full size is like a king size right? me: no, a full size is like a full size. customer: i don't get it. customer: oh, well what is it like? me: (umm...a full size?? really??) it goes twin, full, queen, king. me: Thank you for calling Linens N Things Roseville-how may I direct your call? customer: yeah, i was wondering if you could check on something for me? me: what were you looking for? customer: oh, they were those trains that were at the front of the store this weekend. me: right. (trying to stay patient) We have 3 different sets of trains, which one did you have the question about? customer: oh. i get it. I expect things. *gasp* Not in an obvious, selfish, give-it-to-me-now kind of way. But in the "I think I've been pretty good and God could throw me a ball here and just help me get to first base" kind of way. I strike out all over the place. I've screwed up more things than I care to count. At times, I haven't worked as hard as I should have or could have. And despite having the knowledge of all this, I still expect things. I fall in the 95% of Americans who feel they are entitled to something-but who knows what? But I also fall in the .000001% of Americans who feel that way and can admit it. Part of my hesitation of accepting God has to do with the fact that I didn't feel he gave me enough. I know, right? How ridiculous. God gave me life. God gave me wonderful parents (4 of them to be exact--double what everyone else gets). God gave me absolutely wonderful siblings. A devilishly handsome nephew and a beautiful peanut of a niece. He gave me the most fantastic friends a girl could ask for. But I wanted more. I wanted the boyfriend. I wanted the great job. I wanted an apartment (or...ya know...that really cool house). I wanted to get married. I wanted to have kids. I wanted possessions that I didn't don't need. I wanted all the things that everybody wants. And I wanted them handed to me. I could work for them. But did I want to? Why would I when I have such an amazing God who, based on everything I'd been told about Him, could give me those things if He so chose?? I have always been grateful for everything I have. I've been gracious and accepting and thankful and appreciative. But somewhere, back in that part of my head I can't (or didn't want?) to control, these thoughts were milling around. And I kept thinking "listen up God...if you just give me this one thing that I really really want, then I'll know you're real and I can believe." Guess what? God didn't give me what I wanted, He still hasn't given me everything I want. He's teaching me to trust in Him and believe in Him regardless of whether I "get" the things I want or not. This is lesson number one. No matter what happens in your life, God will always be there for you. And until you choose to accept that and believe in that, God is not going to give you what you want. In fact, God's never going to just hand you what you want. His purpose is to teach us to work for the things we want. While He has the ability to hand us whatever we want, He won't do it because what does that teach us? Absolutely nothing. So while my thoughts may occasionally still shift to "come on God...just that one thing"...I hope He doesn't give it to me. Well. Scratch that. I hope He does give it to me--but only AFTER I've proven that I earned it and that I deserve it. Everybody wants. It's the most natural thing in the world for anybody--whether they give millions to charity every year or are the most selfish person in the world. EVERYBODY wants. But the distinction must come when you realize you may want something...but that does *not* mean you are entitled to it. When that lesson is learned, only great things can come. Great things that God (already) has planned for you. Recently someone told me I should let God love me. (ok so the lyrics to a song told me that but really who's keeping track?) The bottom line is...I think I'm about ready. So the content of this post is something I've been thinking about for a really long time--and honestly, I've been trying to put it into the right words for a long time. Some of this may not make sense--and some of it might not make sense right away but later on, it will. and I'm going to give you a fair warning: I'm going to be all over the place and this post might be a little long. I think I just need to come out and say what I want to say and then add in the rest after. I have always been a Christian. I was baptized as a baby. I went to Sunday School every Sunday. I was confirmed in high school. I celebrated Christmas and Easter and all the 'church holidays' in between. In high school, I was at church every Wednesday and Sunday. Sometimes more. I knew Jesus existed. I knew God was real. I believed in the Bible. I was, by every account, a 'normal' Christian. Yet I still had doubts. Did Jesus really exist? How do I know God is real? What has he ever done for me? I would think about all of the things I had been through and I would think "what did I do to deserve this?" Don't get me wrong, I knew there were people in the world who were suffering more than me. I knew there were millions of people whose lives were so much harder than mine. But that also added to the doubt I had. How can a merciful God create all these situations? How can he allow good people to die so young? How can he create hurricanes and earthquakes and tornadoes that kill thousands of people? How can he allow so many people in the world to live so luxuriously while there are hundreds of thousands of little children who don't get to eat every single day or don't have a roof over their head? It was never hard for me to acknowledge God. But it was hard for me to BELIEVE in him. Do you see the distinction? As time went on, I was slowly making my way towards fulling giving myself over to God. And then my best friend died. The person who, to me (and probably everyone else that knew him), was indestructable. The person who got into accident after accident and did dangerous things and yet, nothing. ever. happened. He persevered. Nothing could happen to him. He had been there for me through thick and thin every single day of my life since we were four. I talked to him every single day. I saw him every single day in high school (including holidays--seriously, you might have found us in the movie theater on Thanksgiving and Christmas night--it was just something we did). He was the person who would know if something was wrong the second he heard my voice. He made me happy when I was sad. He calmed me down when I was upset. He made me laugh when I needed it most. This is the kid that taught me to drive, for heavens sake! And in an instant, he was taken away. I know HE did it. I know Phil did it. But it was God's plan. This was always God's plan for Phil. I just wanted to know why. And when that happened, I seriously questioned my faith in God. And I questioned it for a long time. I don't question it anymore. If you haven't noticed, a lot of my blogs lately have been talking about God. Or mentioning Him in some way. It's because I want Him to be a part of everything I do. I want Him to know that I trust Him, that His plans are good enough for me. I want Him to know that my faith revolves around Him and what He has designed. I fully trust in my God. And I want the world to know that. Now onto the scariest part (for me) of this post. The reason it took me so long to write this post is because I fear judgment. I fear people judging me for my thoughts and feelings. I don't want anyone who reads this to think I'm fake. And I'm scared that because I'm consciously changing, people are going to misinterpret that as fakiness. And I know that when it comes down to it, I shouldn't care what anyone else thinks. But it's such a normal fear. I don't want to be judged for something that is so important to me. For something that has completely changed me and will continue to change me forever. For something that has made me a better person. I hope anyone who reads this takes my words to heart and gives me a chance to prove myself (not that I should have to) before judging me. I want to live the rest of my life praising God for everything He has done for us. For everything that He continues to do for us. I want to live my life helping others. I want to know that I can make a difference. I want to know that my best friend did not die without purpose and reason. I want to believe in the fact that Phil is well taken care of by the best Father one could ask for. I want to know that I WILL see Phil again and I want to believe that I will meet my Savior one day. I want to stop judging people and I want to give them the benefit of the doubt. I want to realize that what other people think of me is the least of my worries. And I want to realize that what God thinks of me is my biggest concern and my biggest joy. I want to make Him proud. I want Him to be able to smile down at me every single day. And when I finally leave this earth, I want to meet God and the only thing I want to hear Him say is how proud of me He is. I want to let God love me. All of me and nothing less. Before you begin reading, I want you to know that you're not going to understand a whole lot of this post until you read the next one. Well, you're not going to understand all of the God-loving going on at least! I went to Winona this weekend to celebrate Ali's birthday. 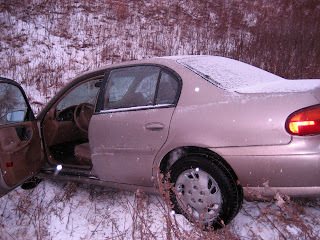 As I was driving home on Sunday, my car hit a patch of black ice on the highway. Thank God there was no one else on the highway around me because my car fish-tailed a little bit and then spun around 4 times. Had a car been behind me or even within a few hundred feet on the highway, I'm sure I would have been hit. 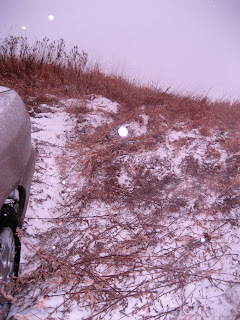 After the last spin, my car was headed toward the ditch--at first, I thought my car was going to roll--the ditch was pretty steep and pretty deep (yay rhyming?). For some unknown reason (i.e. someone looking out for me from above), my car headed nose first down the embankment instead of rolling. I stopped about 25 feet down the ditch and just sat there for a minute thinking "what just happened?" reason #3 why blah blah blah! *disclaimer* most (and i stress the word most) of my responses are not what I actually have said to people...but sometimes you just can't help yourself! me: thank you for calling linens n things, roseville. this is melanie, how may i direct your call? customer: hi is this linens n things? ...this one is quite frequent...but the best one yet is the person who asked if this was lnt and then said "ok melanie so i'm looking for..." ...if you heard my name, i'm pretty sure you heard the rest of my spiel! customer: hi, i need you to look for the (insert brand name) comforter in a queen size for me. ...oh i'm sorry, i asked where i could direct your call, not what i could personally help you with. customer: so....are all sales final? me: no. the huge red, yellow and black signs that say "all sales final" are just a joke...we figured if we played our april fools day joke early, we'd really get you! customer: are you guys going out of business? customer: oh what's with all the signs? me: so you can see them then? they're not invisible? customer: do you have anything in the back? me: ma'am, half the store is empty and roped off..do you think we have anything in the back?? customer: can you tell me how much this will be? me: math skills are beneficial in life..maybe you shouldn't have quit the third grade. it's going to be $59.99. ya know, cuz 100 minus 40 is 60...pretty easy. and not just for math whizzes like me. customer: if i buy a display, do i get an extra discount? me: because 60% off isn't enough for you? customer: when do your prices go down next? customer: is it always the same day? customer: how often do they go down?